Heart will reunite for the first time in three years when they head out on a tour of North America this summer. The Seattle band went on an extended hiatus following an August 2016 incident that saw singer Ann Wilson’s husband, Dean Wetter, involved in altercation with guitarist Nancy Wilson’s children backstage during a hometown show in Seattle, WA; Wetter eventually plead guilty to two counts of fourth-degree assault and was put on two years of probation with no contact with his nephews. Following a solo record by Ann and a release by Wilson’s new outfit, Roadcase Royale, the Wilson sisters will return to the road together for a 39-city trek that will begin at the Hollywood Casino Amphitheatre in St. Louis, MO on July 9. 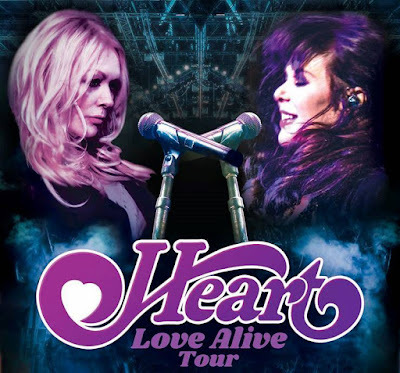 Billed as the “Love Alive” tour after the group’s track from 1977’s “Little Queen”, the series will see Heart joined by openers including Sheryl Crow, Joan Jett & The Blackhearts, Brandi Carlile, Elle King and Lucie Silvas. "I think the tour will spark some positive new energy as we rediscover some of our iconic songs and also some fan favorites," says Nancy. "Calling the tour 'Love Alive' was something Ann and I felt instantly good about. We have always had many love-themed mottos along the way like 'Love Rules,' 'Love Wins,' 'Love is It' – and, of course, it's a very cool song as well." A Citi cardmembers presale runs from Wednesday, February 13 at 10 AM, local time until Thursday, February 14 at 10 PM local time through Citi's Private Pass program, with general public tickets for almost all dates available Friday, February 15 at 10 AM, local time; check with your local ticket provider to confirm details for the show in your area. Last month, the Seattle outfit released “Heart: Live In Atlantic City”, which captures a 2006 performance where they were joined with a number of special guests including Alice In Chains, Duff McKagan, Dave Navarro of Jane’s Addiction and more.